The rematch was supposed to give us so much more. 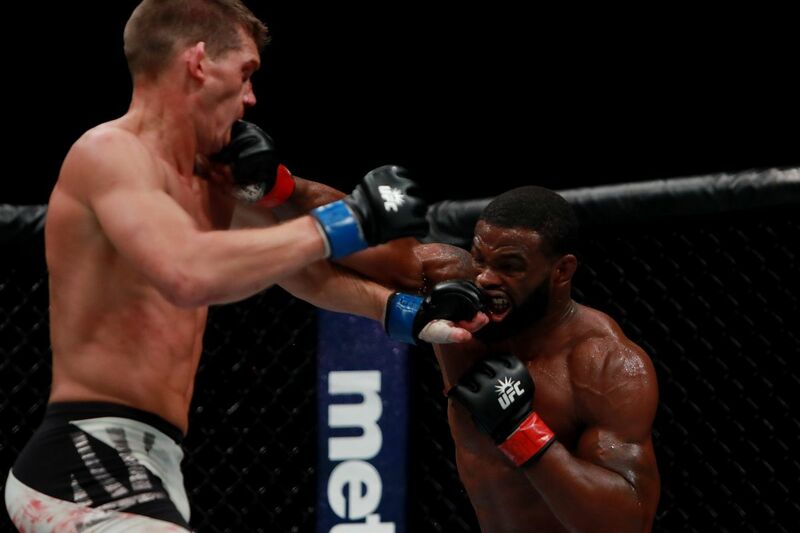 Tyron Woodley promised to finish Stephen Thompson in a a second go-around of a 2016 fight of the year candidate. Thompson thought he learned his lessons from the first fight and could get through Woodley’s defense. The problem? Neither wanted to make the first move. If it’s styles that make fights, then we need to realize the first fight was an anomaly. Woodley and Thompson both said after Sunday night’s bout that they are counter-punchers and were waiting for the other to make the first move, calculating with every step as they circled the octagon for what felt like the thousandth time. But the styles of Woodley (wrestling) and Thompson (karate) just don’t make for a great fight. Thompson was too disciplined to fall for Woodley’s feint punches, and Woodley was too smart to get close enough for Thompson to land those devastating kicks. So the fight went to the judges’ scorecards, and it could have gone in either direction after five rounds. The fans hate decision fights in just about every instance because, especially in a main event like this one, nobody can truly tell who won the fight. The scoring becomes so technical that nobody knows what one judge is going to value over another. While Woodley walked away with a majority decision (48-47, 47-47, 48-47), another set of judges could have gone in the opposite direction with Thompson winning by unanimous decision based on octagon control and presence. The two fighters landed a total of 173 strikes in their first go-round back in November 2016 compared to 133 on Saturday with the majority for Woodley coming in the fifth round. Fans wanted to see this rematch over a Woodley-Demain Maia fight so that there could be a “clear” winner. Instead, they’re left feeling more confused than before. While UFC’s new management is still figuring out this matchmaking thing, the hope is that they will pay more attention to the variation in fighter styles when picking championship fights. Because when UFC was first established, that was the whole point -- matching a boxer against a jiu-jitsu specialist, a karate master against grappler, etc. Even with more and more fighters training and learning in more disciplines, each fighter still has weaknesses that can be exposed. Saturday’s event exposed UFC’s weakness. Two pay-per-view events into 2017 and UFC’s two main event draws have been complete flops. Neither championship fight (Woodley-Thompson and de Randamie-Holm) gave fans a clear winner, leaving them wanting more. That’s not exactly the best way to expand a fanbase. There’s still plenty of time to fix it this year, but when a 35-year-old Georges St-Pierre can walk in off the street after a three-year layoff and get an immediate title shot a weightclass above what he fought at for years, it feels like the press conferences are becoming more important than the actual fights. We all want to see tremendous athletic feats in the cage, but with so much money now on the line in these title fights, there might need to be a change of some sort to press the action. If not, UFC could go the way of boxing and fall back into being a niche sport. Following his UFC 209 loss to Alistair Overeem on Saturday at T-Mobile Arena in Las Vegas, Mark Hunt revealed that he suffered a broken tibia, but that turned out to be an incorrect diagnosis. Ariel Helwani of MMAFighting.com reported Hunt does not have a broken tibia and is out of the hospital. Helwani did note that Hunt was initially told he broke a bone. The 42-year-old New Zealand native lost by knockout in the third round after taking a knee to the face. Saturday marked Hunt's first bout since he locked horns with Brock Lesnar at UFC 200. Hunt was originally ruled the loser of that fight, but it was changed to a no-contest after Lesnar tested positive for clomiphene and hydroxy-clomiphene. Tim Sylva vs. Andrei Arlovski 3. Ken Shamrock vs. Dan Severn 2. Anderson Silva vs. Demian Maia. Those fights, all-time stinkers, were not the fights the UFC 209 rematch between Tyron Woodley and Stephen Thompson were supposed to conjure. Not after Woodley and Thompson fought to a memorable draw which took Fight of the Night honors the first time out on the historic UFC 205 card. And yet this is where we stand on Sunday, after Woodley and Thompson engaged in a staring contest for the better part of 25 minutes at Las Vegas’ T-Mobile Arena, with Woodley spending minutes at a time with his back to the cage and Thompson coming off like a video game character whose buttons kept getting stuck when it was time to strike. Oh, and since the participants and UFC president Dana White were all defensive about the criticism of the fight, let’s say this up front: Yes, people who don’t fight get to criticize. Woodley and Thompson would blast all of us in a matter of seconds if any of us were in the cage with them. That absolute truth doesn’t make this fight any less bad. You don’t have to actually shoot heroin to hold the opinion shooting heroin is bad for you. Some things are obvious, and that this was an awful fight is one of them. Woodley, in particular, has made a habit of placing a chip on his own shoulders without any prompting. He’s an honest and upstanding man and he’s made valid and important points about the state of racial relations in mixed martial arts. But the building of a star isn’t entirely on the promoter. Conor McGregor and Ronda Rousey became megastars because they went above and beyond in building their personal brands. You can’t put on a performance like UFC 209’s main event and say it’s all the UFC’s fault you’re not breaking through. So was this actually the worst title fight the UFC has produced? I’m going with “no, it wasn’t.” Woodley deserves credit for digging down deep in the fight’s final moments and proving his championship mettle. That counts for something. Contrast that with Sylvia-Arlovski 3 at UFC 61, which was orders of magnitude worse and didn’t have the blitz at the end, or Shamrock-Severn at UFC 9, which resonates in its badness all these years later in part because it was the last thing most of us remember before the roof caved in on the SEG era, or Silva-Maia at UFC 112, which was so bad it became bizarrely compelling toward the end. But the simple fact Woodley-Thompson is being mentioned in the same breath as these fights speaks for itself. The fans who are being lectured not to give their opinions, have come away from back-to-back pay-per-views saying they just wanted to forget the night even happened. That’s not exactly the way to move the business forward. (Note: The main event was so odious, it’s obscuring the fact that up until that point, UFC 209 was chock full of fun performances. So I’m going to focus on those here). Up: Alistair Overeem. As bad a taste as UFC 209 left for fans, between the Khabib Nurmagomedov-Tony Ferguson fallout and the non-memorable main event, the crazy thing is, we ended up finding out later it could have been worse. At the post fight-news conference, Overeem revealed he had been hosptialized the previous day with food poisoning. You wouldn’t have known it in his performance against Mark Hunt, which came off like two dominant rams locking horns for hours before one wore the other down and took control of the herd. And as you remember how dramatic Overeem’s TKO win was, imagine how much worse UFC 209 would have been without it. Overeem not only did the show a solid, but he emerged as someone still a force to be reckoned with in the heavyweight division. Up: Darren Elkins. See this recap? It was written entirely from scratch after the fight, because I had already written the “Mirsad Bektic wins” recap and was simply waiting on the official score and Bektic quote. That’s how far behind Elkins was on the scorecards (officially, he was down 20-17 going into the third) before rallying for one of the most memorable comeback victories in the history of the sport. The ultra-tough Indiana native dug down and found a way to rally in the sort of manner that reminded you way you were attracted to this sport in the first place. For me, Anderson Silva’s fifth-round submission over Chael Sonnen is still the sport’s greatest comeback due to the stakes involved, but Elkins-Bektic is right up there with fights like Cheick Kongo-Pat Barry and Scott Smith-Pete Sell on the list of the sport’s all-time great rallies. Up: Iuri Alcantara. It’s not often a fighter takes a beating for eight minutes, including a blatant illegal knee to the head, and ends up on the “up” side, but when you’re as sneaky a submission artist as Alcantara, these things can happen. Alcantara took advantage of a split-second opening and earned a nifty submission over Luke Sanders, his 14th career submission, and just like that, the Brazilian vet finds himself with two straight wins and three in his past four. Up: Dan Kelly. What’s not to like about a fighter who is 39, has been through the grind of Olympic judo on four separate occasions, has a physique that suggests more time spent at the local pub than the gym, and has an Australian accent, to boot? Kelly’s window is likely to be short, given both his age and a knee that he admits needs surgery, but he can’t afford to take a year off at this stage. Which makes his victory over Rashad Evans all the more sweet. Kelly relentlessly pressured Evans, never let him be comfortable, never let him get into his groove, and turned the bout into an oddly compelling affair. This could end up being Kelly’s signature moment, but either way, it will be fun to see how much further he can take this. Up: Cynthia Calvillo. On one level, there’s only so much you can learn from a short fight with the 2-3 Amanda Cooper. On another, the level of skill Calvillo showed in her lightning-fast transition from an anaconda to getting Cooper’s back and sinking-in an RNC makes her look like a fighter with a seriously bright future. Team Alpha Male, meanwhile, is showing no signs of slowing down in Urijah Faber’s retirement. *First off, kudos to ref Marc Goddard for deducting Sanders a point on a flagrant illegal knee to the head in Alcantara-Sanders. Far too many refs do the “hey, if you do that nine more times, I’ll consider giving you an official warning” thing. Goddard, who you may recall practically had to beg to be licensed in Nevada a few years ago, got the call right. *Any time spent quibbling over 10-10s, 10-9s, and 10-8s in Woodley-Thompson -- other than to note Sal D’Amato’s 10-8 for Woodley in round five was pretty ridiculous -- is time keeping us from moving on from this fight. *Kudos to Nevada Athletic Director Bob Bennett for showing up and answering questions at the post-fight news conference. With situations like the infamous Nick Diaz five-year suspension, NAC had developed a reputation as an out-of-control, unaccountable organization. Getting out in public and answering critics is a big, positive step in the right direction, and hopefully one other major commissions will begin to emulate. *Nurmagomedov missed a flat $500,000 payday by not showing on Friday. Ferguson made his $250,000 show money, since he weighed in. It came out on Friday that UFC wanted Ferguson to take a pay cut to fight Michael Johnson, which Ferguson turned down. We don’t know how much exactly that suggested pay cut was, but we do know this: At the end of the day, WME chose to nickel-and-dime Ferguson, who did everything he was supposed to do. And in doing so, they chose to make UFC 209 an objectively worse product for the people who bought tickets and ordered the pay-per-view, a decision magnified by the lousy main event. If WME manages to fumble away this boom period, it will be due to a death by a thousand little cuts. Yeah, I know, Demian Maia, blah blah blah. Anyway, Georges St-Pierre is fighting Michael Bisping. Conor McGregor has many options besides Woodley. The welterweight division is missing the fire of the Robbie Lawler era, so at this point, just for the sake of seeing something exciting, I say bring the former champ back for another crack at the belt. 0 Response to "UFC 209 main event shows how far MMA has come and how far it still needs to go"